Why do we love our iPhones? The answer is simple. This device is capable of many things: music, podcasts, movies, photos, news, and surfing on the Internet and, of course, applications. All the most relevant and interesting is in your pocket. However, to manage this entire media farm you will need a special application— iTunes. No doubt, it is good in many ways, except for the fact that it is not user-friendly for beginners. Many of them simply give up using such a complicated product because they cannot convert music to iTunes. That is why a lot of users search for alternative ways for converting the music in iTunes. Part 1: Will Converting Music Reduce Sound Quality ? When you convert music from an uncompressed format to a compressed one. When you convert from compressed format to compressed format as well. Remember when people copied from old VHS to another, and every time the quality spoilt. However, you may even not lose the quality if you convert from an uncompressed format to the same uncompressed format. It may sound weird to compress music according to the above information, but that is not true. On the one hand, the compression may distort the file. On the other hand, you can store more music on your device. In fact, if you compress the file too much, you will definitely hear the difference between the quality of compressed and uncompressed files. However, if you continue listening to such music your ear will adjust to it. So you may need a music converter to do this. mong the wide range of alternative music converter to convert music to iTunes, there is one which in on the top of the list – iMyFone TunesMate Music Manager. With the help of iMyFone TunesMate, you can not only convert songs from iPhone to iTunes but also export iPhone music to computer. iTunes is a one-way synchronization tool: from computer to devices with a coating of existing files. TunesMate offers two-way synchronization PC to devices from devices to computers that do not cover the existing files. 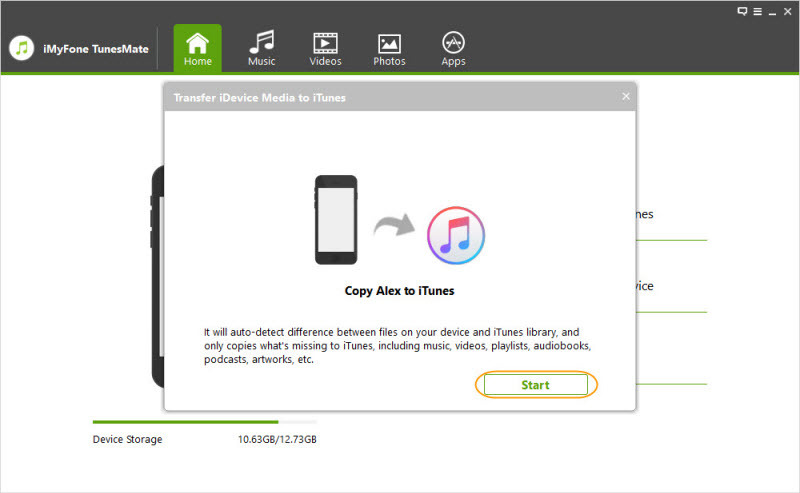 TunesMate makes it easy for users to transfer any song from any computer to any iPhone, iPad, iPod and iTunes of violation of the restrictions of iTunes for sharing songs between computers and devices. 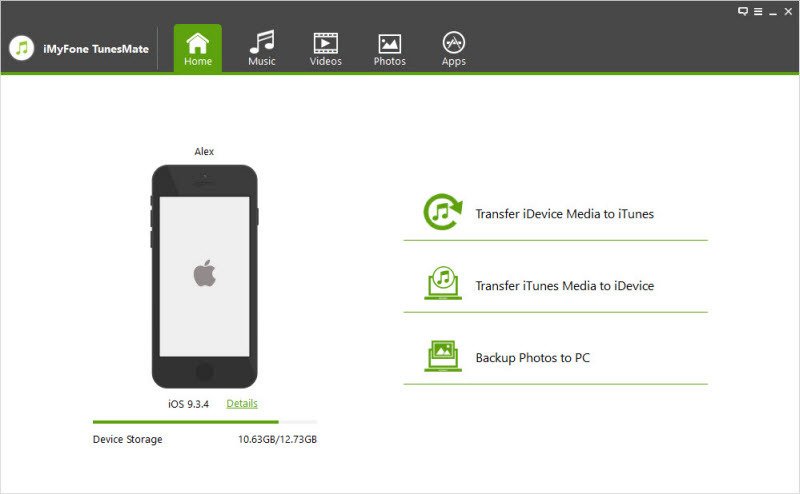 TunesMate allows you freely transfer music between iOS devices and iTunes or PC. Easily synchronize your iTunes library to your iOS device without losing any data. 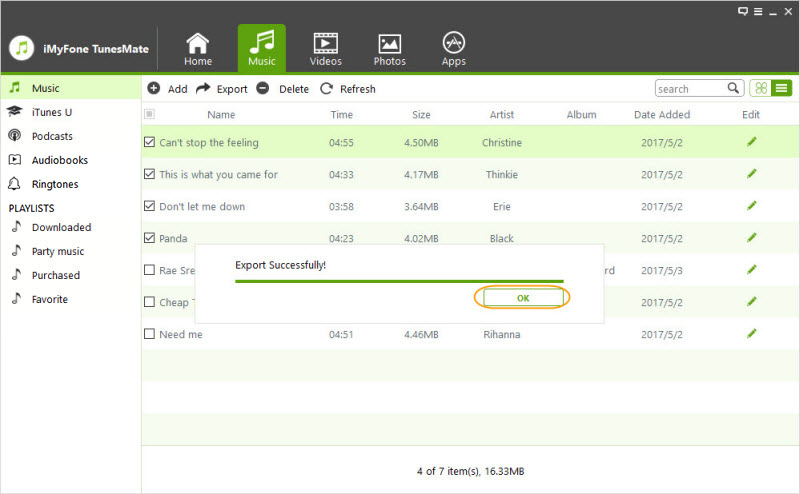 It can be used to transfer both purchased and non-purchased music. Transfer various kinds of media files including music, videos, photos, playlists, ringtones, podcasts, audiobooks and 10+ more. With this method, you can transfer all the music in one time. Apart from music, other audio files including iTunes U, Audiobooks, Podcasts and Playlists are available as well. Step 1: The first step that you should do is to launch iMyFone TunesMate on your computer. Step 2: Click "Transfer iDevice Media to iTunes" from the Home interface, and click “Start” button from the pop-up window to continue. Step 3: All the media types will be checked by default. You can uncheck the types which you do not want to transfer. Step 4: Then click "Start" button to begin. Click "Complete" button from the pop-up window to finish it. With this method you can convert music to iTunes selectivly. It will detect all the iPhone/iPad/iPod audio files which are not existing in iTunes library and only transfer them for the avoidance of duplicates. Step 2: Click on "Music" tab at the top of interface and you will be in the "Music" window by default. You can also go to "iTunesU/Audiobooks/Podcasts" from the left sidebar. Then tap "Export > Export to iTunes" at the top bar. Step 3: When the export process finishes, a window will show "Export Successfully". Click "OK" to close the window. 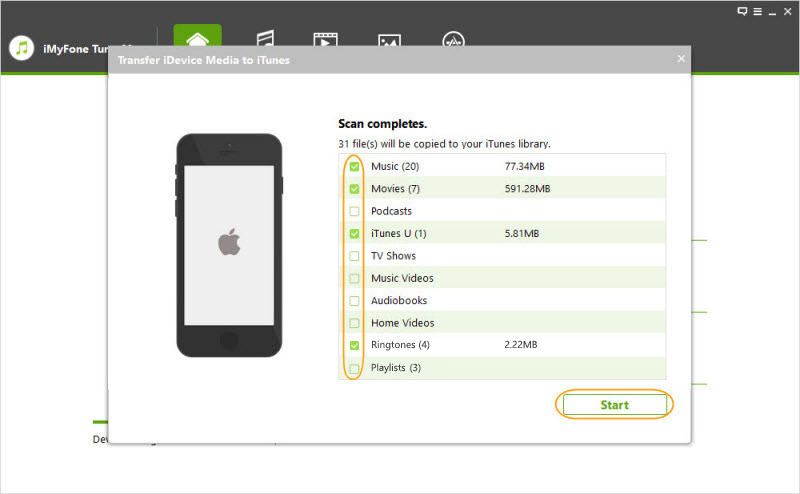 To convert music to iTunes is a complicated process. Not everyone can fulfill it in a right way. That is why many individuals have never tried to do it. They find alternative ways of converting music. 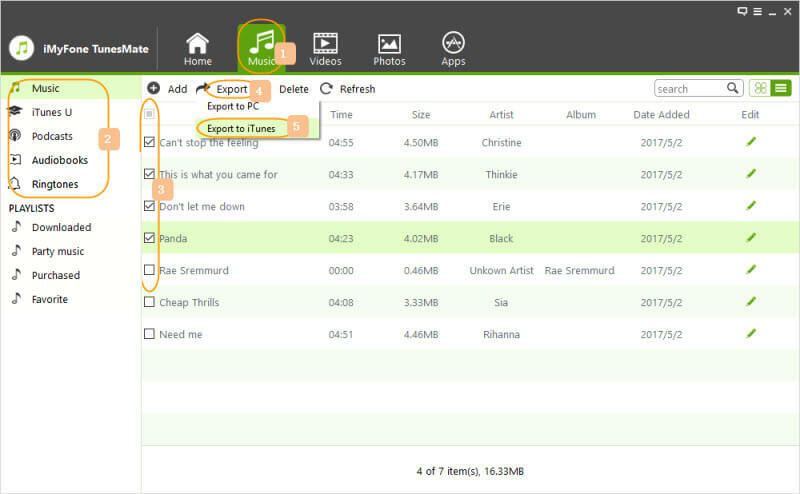 By downloading a special program, the user may transfer the favorite song to the device or PC. One of such programs is TunesMate it enables to do any actions with the audio files in iDevice. It is easy to operate and does not take a lot of time.